A gladiatorial fight would usually involve two gladiators but similar types of gladiators such as the Velites, would not normally fight each other. The first Roman Gladiators were prisoners of war and used the weapons and equipment characteristic of their people. The early enemies of Rome included the Samnites, the Thracians and the Gauls (Gallus) and gladiators were named according to their ethnic roots. What type of gladiator was a Velites? What weapons and armor did they use? What was their style of combat? And what type of gladiator was matched as their opponent? 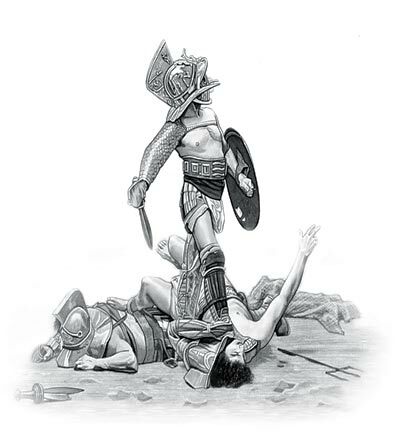 - Fighting style: The Velites were lightly armored gladiators so they had the advantage of agility, mobility and speed. The content of this Velites category on the different types of gladiator who fought to the death in the gladiatorial combats staged in Ancient Rome provides free educational details, facts and information for reference and research for schools, colleges and homework. Refer to the Colosseum Sitemap for a comprehensive search on interesting different categories containing the history, facts and information about Ancient Rome. Interesting facts and information on this type of gladiator: their weapons, their armor and their style of combat.